Sniffles dropped to the floor. “I want a bite of her food. No, I want a steak; a big, juicy, rare steak with a bone in the middle. I want a t-bone.” He licked his lips and ran over to his dog dish. “I guess I’ll have to settle for this.” With grumbling thoughts he devoured his canned dog food. Emily spread the peanut butter and jam on her bread. “I love peanut butter sandwiches.” She gobbled two whole sandwiches. “Oops!” Emily spilled the jar of peanut butter and it bumped into the jar of jam. Both spilled on the counter. 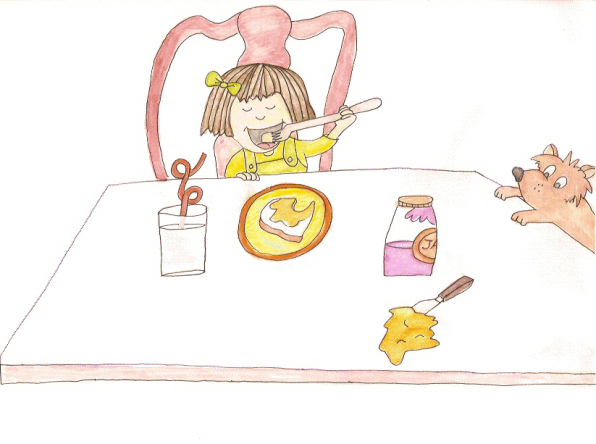 The peanut butter was thick and sticky and stayed near the jar, but the jam spread all over the table. Sniffles’ ears poked up. His tongue slinked across the table and he licked some of the jam up. “Not bad.” He then licked the peanut butter. “This is quite good. No wonder Emily likes to eat peanut butter and jam sandwiches for every meal.” Once the table was cleaned, Sniffles ran over to his dog dish. “It wasn’t t-bone steak, but I liked it.” He finished off his dog food and lay down for a nap, dreaming of steak smothered in jam and peanut butter.